Every family has certain genetic predispositions. One of those predispositions in my family is the worry gene. We can worry with the best of them. Maybe it hasn’t happened. Maybe it isn’t likely to happen. But it could happen, you know. That leaves the door cracked just enough for worry to slip in. I hate worry. I hate the way it devours my energy, steals my joy, and keeps me looking over my shoulder. I fight it with all I have. I usually maintain the upper hand by day. Then there is the night. Sometimes when I wake up in the middle of the night, I discover that there are monsters in my bedroom. They look like the worries I scoffed at by the light of day, but at night when my defenses are down they look much scarier. At night I feel vulnerable and completely at their mercy. One day I was going through a box of random stuff when I ran across a prayer bracelet I bought years ago at Montreat. It came with this book. I’ve always liked to hold tangible objects when I am nervous. I have at least one paperclip in the pulpit with me every single Sunday. I have a couple of small smooth stones that I sometimes carry in a pocket. There is one that stays in the pocket of my robe just in case my Sunday paperclip isn’t enough. Sometimes I think that my addiction to having my phone with me so often is as much having something to hold and fiddle with as it is the phone itself. Prayer beads are a natural fit for me.Each bead in the bracelet has a meaning or theme that you can use to help focus your thoughts. There is a large gold bead, representing God. That is my Alpha and Omega bead – the bead where I start and where I end, if I make it all the way around before falling back asleep. Because it is the largest bead, it is easy to find even in the dark. 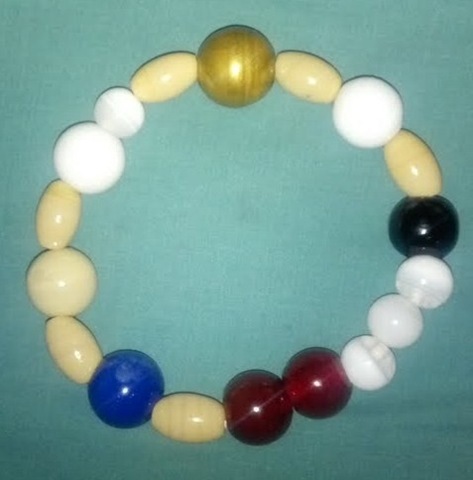 There is a small white bead – the I-bead; a larger white bead – the Baptism bead; a tan bead – the Desert bead; a blue bead – the Serenity bead; two red beads – the Love beads, one reminding us to accept love and the other to share love; three small white bead – the Mystery beads that are our concerns, questions, or requests; a black bead – the Night bead that represents the dark nights of the soul; and another white bead – the Resurrection bead that reminds us that from all things, God can bring new life and hope. Interspersed in various places of the bracelet are six oblong tan beads – the Silence beads. I don’t know about you, but I sometimes need to be reminded to just shut up for a minute so I can listen. When the monsters invade my bedroom at night looking much more intimidating in the dark than they do by the light of day, I often reach for my beads which are always on the table by my bed. I fumble around with them in the dark until I can pick out the large gold bead. Then I begin making my way around the circle of beads, trying to keep my mind focused on the meaning of each instead of on the shrieks and growls of worry. More often than not, I will awake the next morning with the beads in hand, having fallen asleep before I made my way all the back around to the Alpha/Omega bead. Who knew that such tiny beads could prove to be such potent weapons? Like the smooth stones in David’s slingshot that killed Goliath, they can take down even the scariest monster of the night. We are all vulnerable to worry at times. What do you do to keep it from taking control? Thanks Jan, for sharing. My family has the worry gene, too. It’s there, even when I think it’s not. What do I do? I pull the covers over my head and close my eyes and practice deep breathing exercises….and hope I fall back asleep soon. But then when I am really worried – I end having to get up and do something. Read, have a cup of tea, distract myself until I can fall back asleep….I do like the prayer bead idea, it’s a good one. What do I do? I call and text you before I go to sleep. I also rely on a surprising large quantity of silly bands. In the middle of the night, I have meditation and meditation music CDs.